With a stunning panoramic view of central Osaka to one side and a roof garden on another, Abeno Harukas Museum is a new addition to Kansai region’s cultural landscape. The museum, housed in Japan’s tallest building to soar 300-meter into the sky, is reached in style and comfort via the dedicated ‘shuttle elevator’. The museum is new. It opened to coincide with the public door opening of Abeno Harukas skyscraper after four years of construction on 7 March 2014. 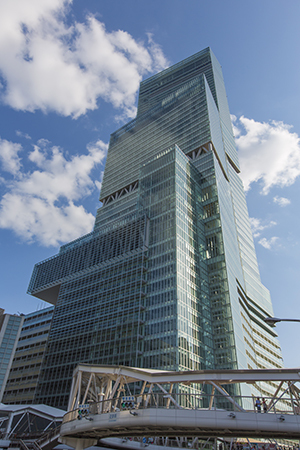 Owned by Kinki Tetsudo Rail, also known as Kintetsu–one of Japan’s main private rail companies–the building is its new flagship multi-purpose complex with 100,000 square meters of floor space spread across over 60 floors. It is a major landmark that crowns Kintetsu’s Minami-Osaka line terminal station, Abenobashi station. The museum is designed to be easily accessible, even for commuters, with its accommodating opening hours in the evening until 8pm on most weekdays. Abeno Harukas Museum is particularly unique for it holds no collection of its own. Instead, the museum puts on special themed exhibitions throughout the year by bringing in collections from other museums and institutions. The museum is not the first of such type: There are of course a number of these so-called ‘empty museums’, coined by Dr Morishita Masa’aki, though limited and primarily positioned in Tokyo. The museum’s director Asano Shugo points out that Abeno Harukas Museum is the first of its kind in the Kansai region, located in the mid-western part of Japan. It is equipped with state-of-the-art facility and sustainably operated without its own collection akin to Bunkamura and the National Art Center in Tokyo. He finds that the lack of its own collection helps allow the museum to think creatively, and to deliver shows that are of pertinent interest to the community. Being able to traverse between different periods, genre and regions by working closely with curators specialising in specific subject areas are some of the benefits of running an empty museum. Early this year to mark the first anniversary of the Abeno Harukas Musuem, a splendid exhibition celebrating the 1200-year history of Mount Kōya was held. 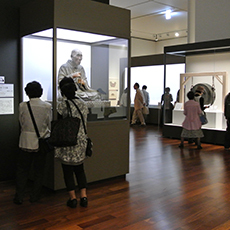 The museum featured sacred treasures from Kongōbuji temple and Koyasan Reihōkan Museum including 14 works designated as National Treasures and 33 as Important Cultural Properties. Kongōbuji is the ecclesiastic head temple of Kōyasan school of Shingon Buddhism founded in 816 by priest Kūkai, and Mount Kōya, where the temple is situated, has been designated as a UNESCO world heritage site. The exhibition was a rare opportunity that lasted just over 6 weeks from late January to early March where visitors could feast their eye on a number of outstanding examples of religious art otherwise reserved for ritual purposes. It attracted 50,000 visitors by the end of its fourth week. As an added bonus, visitors were able to satiate their culinary appetite in addition to the cultural. Partnering with a selection of fine and casual dining providers in the Abeno Harukas building, a range of delicious lunch and dinner menus were created that resonated with the exhibition. For example at Shunpanrō, famous for being the first restaurant to be granted official permission to serve the poisonous puffer fish, offered a special ‘Shizu’ course inspired by the peacock mahamayuri bodhisatva . Guests with deep pockets enjoyed a spectacular display of puffer fish sashimi carefully arranged to mimic the impressive plumage of a peacock. From May to July, a new exhibition will open. This summer exhibition explores works that relate to Kotohira Shrine, a key Shinto shrine in Kagawa prefecture where more than 4 million people visit. Beginning with the famous image of tigers by Maruyama Okyo (1733-1795) on sliding doors, and works by others key artsits including paintings by Itō Jakuchū (1716-1800) and Takayashi Yuichi (1826-1894), an outstanding collection of treasures from Kotohira Shirine will be on display at Abeno Harukas Museum.